Supporters at campaign office. Bulletin board featured news clippings and key election issues. This is the fifth in a series on my experiences as the mayor of Kamloops from 1999 to 2005. I offer it for the interest of anyone who cares about civic politics and our community, and who might be wondering — as we approach a civic by-election Sept. 30 — what really goes on in City Hall. 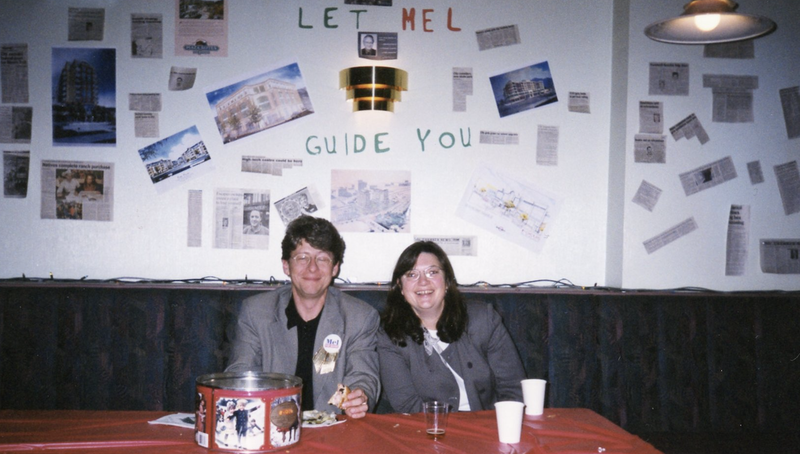 Those comments might seem a little self-serving, since they were made about me, but they were very important in June of 1999 because they told the Mel For Mayor campaign that Kamloops voters were comfortable with the prospect of having me as their mayor. A bad poll, one with an inadequate or poorly chosen sample, or with poorly worded questions that can bias the outcome, is useless. When the Mel for Mayor campaign got underway, I badly wanted to find out where I stood with voters. It wasn’t just that I was running; I have a natural curiosity that doesn’t like to wait for an election to get a sense of where things are heading. Whether it’s a local, provincial or federal election, taking stock of what voters are thinking is part of the excitement. I hate surprises, and don’t understand how some candidates can go through an entire campaign without ever taking a poll to find out how they’re doing. 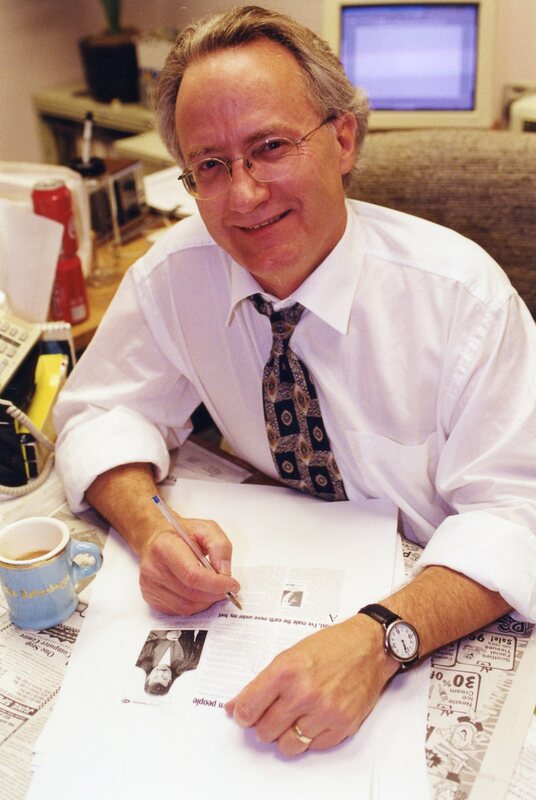 Photo for campaign material, 1999. One of the interesting things about that 1999 campaign is that several different polls yielded very similar results — and I was nervous about every one of them. I was lucky to have a great public-opinion researcher working on my campaign. Doug Balson had owned Intermediary Research in Kamloops for several years, in partnership with Brent Baker, and had built an excellent reputation in his field. I’d even had him as a guest lecturer at a Journalism course I’d taught at University College of the Cariboo. Although he’d moved to the Coast, he still wanted to help out in the campaign. Doug knew how to write a good poll, and how to get a good sample. Polls have a reputation of being very expensive, but if you have the right questions and know how to choose the sample, the main part is done. With Doug’s poll ready to go, we hired a group of students to do the phoning, set up shop in the offices of Joel Groves’ law firm, and went after a sample of 200 eligible voters. It was a smaller sample than normal for such a poll, but it was intended only to get us a general indication of how acceptable I was as a candidate, and confirm some of the issues. At that point, it wasn’t known who all the candidates for mayor would be. Pat Kaatz and Ron Kask were declared, and Arnie Kidner was thinking about it. We added a fifth name, Shirley Culver, since we saw her as a possible candidate. The results were exciting. They showed I was the first choice for mayor of 47.9 per cent of the decided voters surveyed. Kask was second at 19.8 per cent, Culver third with 17.7 per cent, Kaatz fourth with 14.6 per cent, and Kidner trailed with only two per cent. While some of the names and placings of other candidates would change during the election, my numbers would remain very stable. Of those who said they were very familiar with me, or slightly familiar, the “comfort” level was also very high. Asked why they were or weren’t comfortable with the prospect of having me as mayor, respondents seemed very positive. Comments such as “thinks before he acts, honest, clear opinions,” “knows the area” and “ability to communicate” were exactly what we wanted to hear. One voter offered the opinion that “he is a bigot,” which baffled the hell out of me (especially since it was someone who claimed to be a supporter), but it goes to show you some people see you a lot differently than you expect. That first poll also confirmed that people were unhappy with council secrecy, and that they wanted the city to go in a new direction on issues touching on the general well-being and prosperity of Kamloops. Clean water was high on the list of concerns. The poll was helpful in giving us a sense of priorities, and the results were consistent with the campaign strategy we had developed. Barb Duggan, my campaign manager, was busy with all kinds of ways of getting out the message. Her approach was multifaceted. I was out of the gate early with a pretty good TV commercial shot on Victoria Street. We varied the location later on. There were radio commercials, some parallel newspaper ad campaigns, a couple of different brochures, buttons and business cards. Barb came up with the “High Five” campaign, in which we asked supporters to contribute five bucks to the cause. It highlighted the grassroots nature of our message, and raised some money to boot. We had two types of signs: lawn signs and larger, 4 ft. by 4 ft. signs that included my picture. Our strategy there was to gradually accelerate the number of signs leading right up to election day. Barb had organized our committee into sub-committees, or teams, each with specific responsibilities. My brother Bernie was volunteer coordinator, Dale Mortimer was the team captain in charge of business liaison, Ray Abate did fund development, Brent Humphrey was media liaison, Lal Sharma handled canvassing and community liaison with ethnic groups, seniors and teachers, Rod Duncan liaised with community associations, and Shirley Rhodes gave headquarters support. Frank Quinn came on board later as the main fund raiser. Doug Balson, of course, handled polling along with his partner Brent Baker. Our campaign office was a busy place. We had a core group of about 30 volunteers that kept it open throughout the day. Barb McKay, Mary Bezanson and several others spent many hours there. At a candidates’ forum at the Farmers’ Market on Oct. 16, I welcomed everyone to come into the campaign office (a former pizza restaurant on Victoria Street), and added a special twist: A group of a dozen plus students from St. Ann’s Academy, organized by campaign committee member Barb McKay into the youth branch of our campaign, would be there giving the storefront a fresh coat of paint right after the forum. The campaign office volunteers invited people to fill out questions for me and drop them in a box, and we got lots of them. My job was to get back to them with answers. I added another touch of my own to the office, inviting all the other candidates to use it for their meetings and to display their campaign materials. None of the mayoral candidates took me up on it, but quite a few of those running for council did. Several of the candidates would sometimes come for coffee in the morning and we’d sit around and discuss civic issues. They seemed to genuinely appreciate the opportunity. These efforts at inclusiveness gave the campaign a nice feel, but the campaign itself wasn’t always filled with goodwill.